I love celeriac, that unassuming, some might say ugly, winter vegetable. I get quite excited when those gnarly knobbly roots begin to make an appearance. Winter has to have some benefits and celeriac, for me, is most definitely one of them. Its gnarly exterior belies the more elegant celery come nutty flavour inside. It is a versatile root offering quite an array of culinary options. It is great raw in a remoulade, or sliced and layered and baked in a gratin, mashed with some potato, and it also makes a great soup, that was especially good when drizzled with a little white truffle oil. So if you haven't tried celeriac, please don't neglect these not so pretty roots with their wild tangle of roots the next time you spy one. 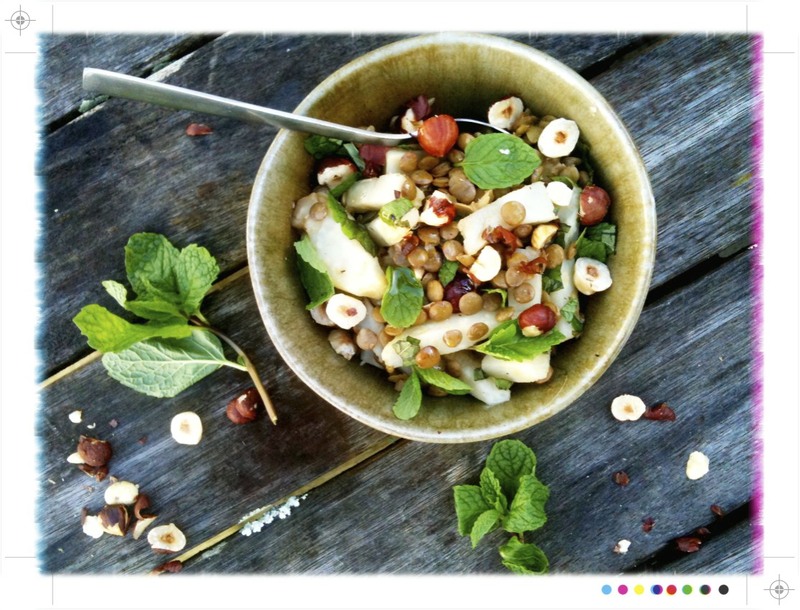 This warm winter salad caught my eye in Plenty, yes Ottolenghi again. But who can resist when presented with new and such delicious sounding combinations? 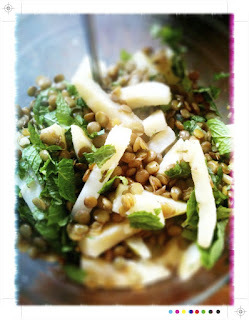 I only had green lentils but they worked out just fine. Sadly among all my various oils no hazelnut, which I am sure would be an amazing final flourish to this dish. However, without the hazelnut oil it is still delicious. Pre heat the oven to 140C (275F). Scatter the hazelnuts on a baking tray and roast in the oven for 15 minutes. Careful not to burn them, I am sure we have all been there. Remove from the oven and let them cool before roughly chopping. 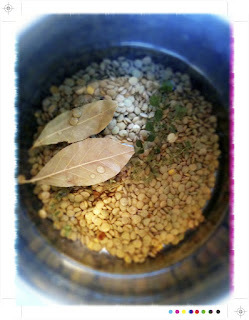 Place the lentils, water, bay leaves and thyme in to a small saucepan and bring to the boil. Let them simmer for 15-20 minutes, or until al dente. Drain and set aside. Meanwhile in another saucepan cook the celeriac in boiling well salted water for 8-12 minutes. You want it to be just tender. Drain and set aside. 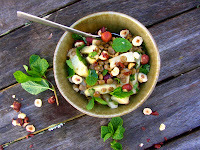 Place the hot lentils in a large bowl, you want them still hot so that they can absorb all the flavours of the dressing. Mix them together with the olive oil, 2 tbsp of hazelnut oil, the vinegar, salt and pepper. Add the celeriac and toss it all gently together. 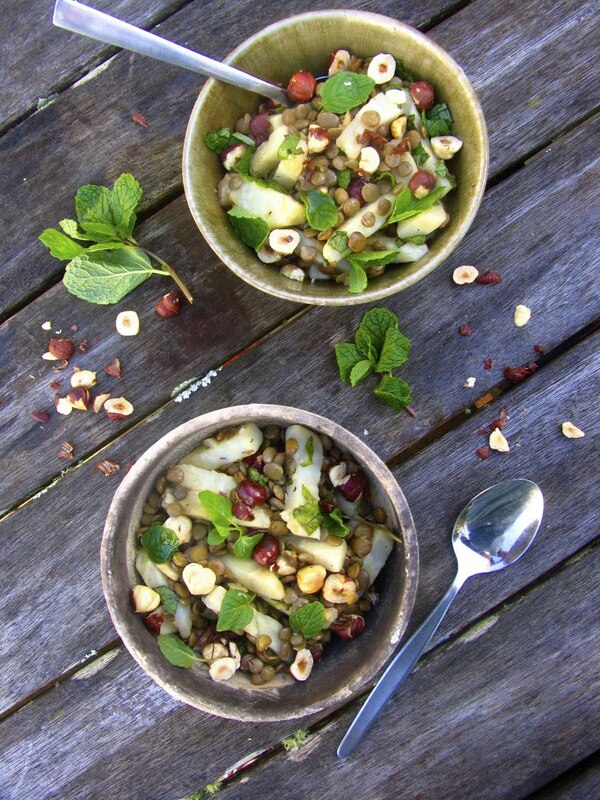 If serving immediately stir in half the mint and half the hazelnuts. Serve on a platter or bowl and drizzle with the rest of the hazelnut oil, or if you don't have hazelnut oil some good olive oil. Scatter over the remaining hazelnuts and min and there you have it. 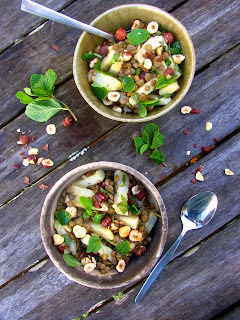 Perfect on its own as a light vegetarian supper or as a side dish if meat is the main event. Alternatively it can be served cold. 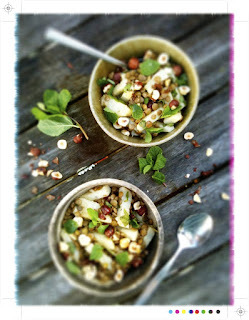 Just wait for the lentils and celeriac to cool down and then add he hazelnut oil, hazelnuts and mint. 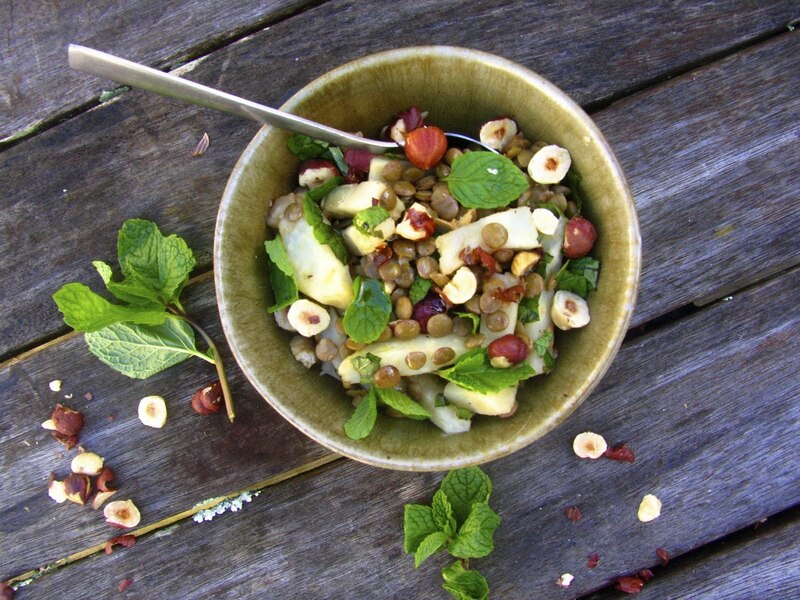 The lentils provide my requisite winter comfort, filling and satisfying, complemented by the nutty, almost sweet celeriac. A crunch delivered by the hazelnuts and a flash of freshness from the mint all melded together by the oils and red wine vinegar. And for the first time...this week I do believe the camera trumps the iPhone. Doing lots of lovely vegetarian dishes lately Mairi!